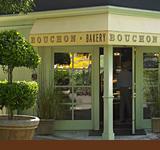 Bouchon Bakery 6528 Washington St., (707) 944-2253. Daily 7-7. This yummy spot bakes baguettes twice daily. Pastries include croissants, sticky buns, and a signature broiche twist drizzled with chocolate. Cookies are exceptional, especially the oatmeal-pecan. In fact, you can pick up the makings for a supreme picnic—heavenly sandwiches, a gooey-centered Valrhona chocolate cake, and cold drinks from the cooler. More things to do in Yountville.